The connector is incorrectly configured. There have been networking or firewall changes in your on-premises environment. 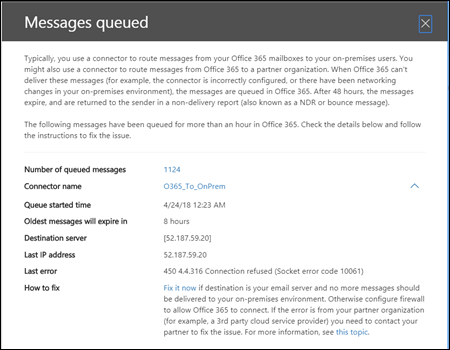 Office 365 will continue to retry to delivery for 48 hours. 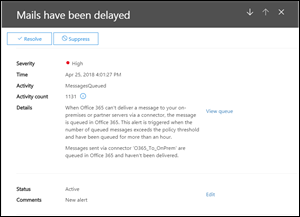 After 48 hours, the messages will expire and will be returned to the senders in non-delivery reports (also known as a NDRs or bounce messages). 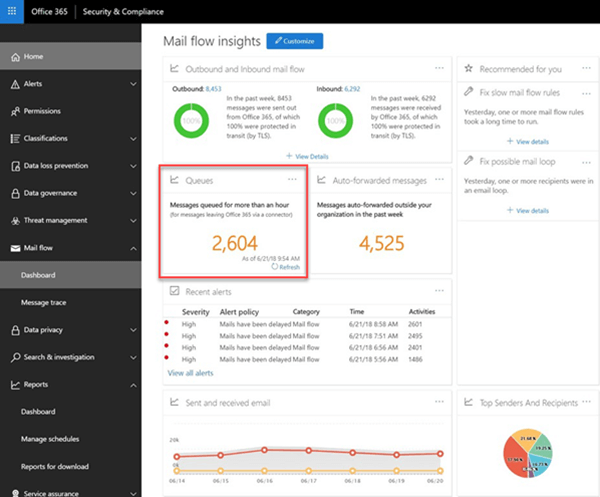 If the queued email volume exceeds the pre-defined threshold (the default value is 2000 messages), the alerts will be available in the mail flow dashboard at Recent alerts, and admins will receive an email notification (to their alternative email address). 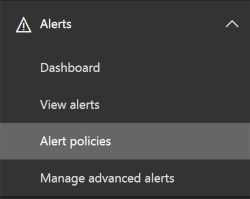 To configure the alert threshold, daily notification limit, and/or recipients of the alert, see the Customize queue alerts section below. Mail flow insights create an alert policy named Messages have been delayed (the Send email notifications check box in the example screen shot below) found in Alerts > Alert Policies. You can modify the threshold and alert recipients by clicking on the policy. You'll see a new policy information blade, you can now click Edit Policy. The information blade will change to the Edit Policy. 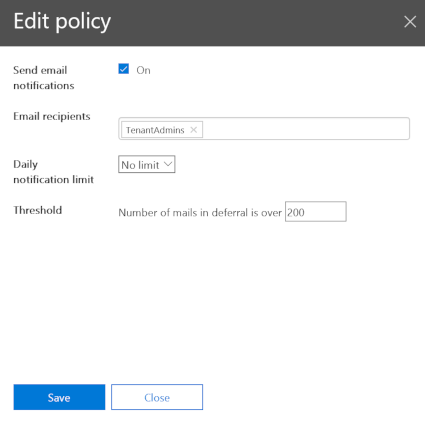 You can now change the recipients for the alert email, the limit on the number of notifications sent per day, and the minimum threshold to trigger the alert (200 or more). When you click the alert, the alert details appear in a flyout pane. You can click View queue in the alert details to see the queue details, problems, and links to the available fixes in a new flyout pane. 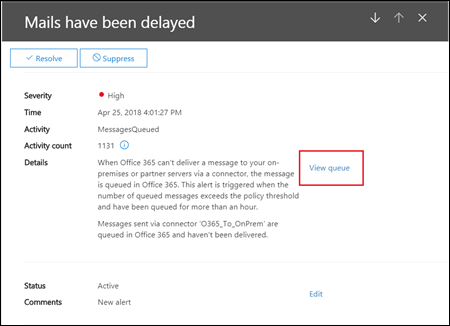 When you click the number of queued messages in Queues, the queue details and guidance for how to fix the issue will appear in a flyout pane (the same flyout that appears after you click View queue in the details of a queue alert).